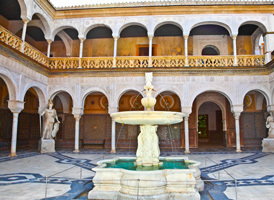 The Casa de Pilatos is an Andalusian palace in Seville, a model of noble family’s residence of the Golden Age in Seville. The building is a mixture of Renaissance Italian and Mudéjar Spanish styles. It is considered the prototype of the Andalusian palace. Ticket: EUR 45.- per person (includes a cocktail reception, 3-course gala dinner, complimentary drinks and entertainment programme). Tickets are available for purchase at KUONI Destination Management using one of the following two options; either via the online booking tool or by completing and returning the booking form. "CIRSE supports compliance with ethical standards. Therefore, CIRSE emphasizes that the present offer (made by KUONI Destination Management) is directed to participants of GEST Europe 2015 and recommends that the participants who want to accept the present offer shall bear any and all costs in this context themselves. Kindly note that entrance to the GEST Europe 2015 Gala Dinner is NOT included in the GEST Europe 2015 registration fee!"